Young Portland team competes with poise, presence -- now, can it win in the WHL playoffs? Seven months ago, the Portland Winterhawks had a proven coach and a roster full of questions. A 40-win season seemed unlikely for a team featuring rookies and players stepping into prominent roles for the first time. But the Winterhawks got to 40 wins, thanks to one of the top offenses in the Western Hockey League. So the question on the eve of the WHL playoffs is: Can the young Winterhawks surprise an opponent with more experience? The answers will start to come Friday in Prince George, British Columbia, when the Winterhawks and Cougars open their best-of-7 series. Evidence suggests Portland (84 points and the 40 wins) could make playoff life difficult for Prince George (45 wins, 96 points). 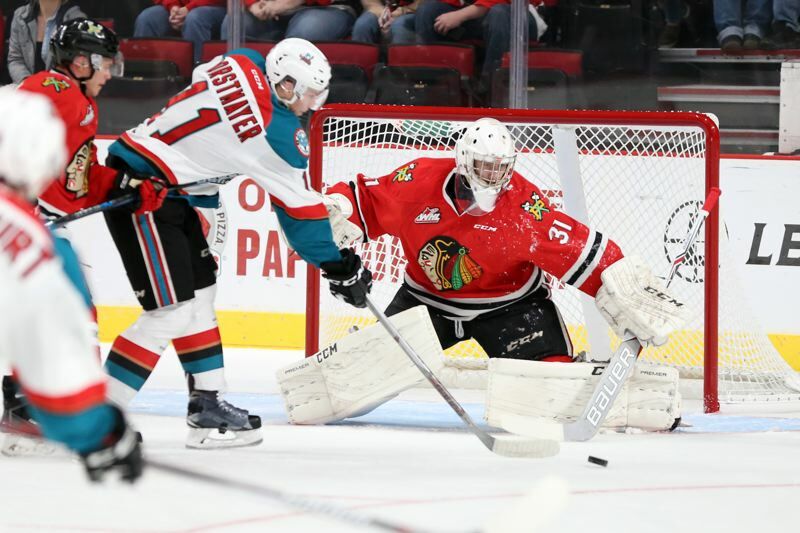 The Winterhawks won eight of their last 10 regular-season games. Goalie Cole Kehler won his final eight starts. Portland's power play and penalty kill rank in the top third of the league. Plus, notes team captain Keegan Iverson, the Hawks have held their own against the best teams in the league — including Prince George. "Confidence comes from beating the top teams in the league. We know we can play with them. We have to rise to the occasion," Iverson says. Mike Johnston echoes Iverson's view. The team's VP, GM and head coach has seen his team play well in big games, among them a 4-1 win at Seattle on Saturday and a 5-4 win over Prince George on March 8. Though few of these Hawks have much significant WHL playoff experience, Johnston considers his team battle-tested. Portland and Spokane were neck and neck for the final playoff spot in January, but his Hawks wound up 18 points clear of the Chiefs. "We've been playing playoff hockey for a while, so I think our guys have got the experience — as best they can with the key games we've played," Johnston says. Among those are four games against Prince George. Portland won twice at home and lost two in Prince George on back-to-back January nights. Both of the matchups in Prince George were tight games, including a shootout win for the Cougars. Still, there is nothing quite like the introduction to playoff hockey, and there is no good way to simulate it. "Nothing you can do," Johnston says. "We can do a lot of prep meetings, but it's mainly the intensity and emotion that you have to get ready for — the compete and how hard people are going to battle for space and time." From the team's veteran leaders, the message for younger teammates will be to concentrate on the basics. "The best thing we can do is lead by example and show them each shift that you've got to crank it up," says 19-year-old defenseman Keoni Texeira. "The game's faster. Guys are finishing every check. Teams are playing very structured. There's not much room for error." Portland started the season with only one 20-year-old — Iverson. Adding Matt Revel and Shaun Dosanjh around the trade deadline provided more stability for the stretch run and the playoffs. "We had played the whole year with a very, very young team," Johnston says. Revel and Dosanjh "gave us some guys now that could have some presence and have some poise. They can settle the team down and encourage young guys when they're going through tough times like they went through when they were younger." Among the rookies, Portland's European players stood out. Finnish defenseman Henri Jokiharju (9 goals, 39 assists) and Danish forward Joachim Blichfeld (28 goals, 30 assists) made the transition to North American hockey. In addition to playing well against the best teams — including going 2-1-0-1 against Prince George — Johnston points to early-season struggles as an important experience for his younger players. "We had some adversity early in the year when we had that (nine-game) losing streak. I thought we handled things well. We really learned some lessons, and we didn't look back after that," he says. The other big question after Sunday's 7-2 loss to Spokane — Portland's worst home loss of the season — was about the health of Cody Glass. The team's points leader spent Sunday in a suit and tie after playing only the first period of Saturday's game at Seattle. Johnston would not comment on Glass' status — or that of forward Evan Weinger, who has missed 10 games. Such silence is expected at playoff time. Glass is a big part of Portland's healthy power play, which finished the regular season ranked fifth in the league (scoring 24.8 percent of the time). His team-leading 94 points was eighth best in the league. His 62 assists ranked seventh. The emergence of Glass (22 more goals and 45 more assists than last season) and Skyler McKenzie (34 more goals and 25 more assists than 2015-16) was a big part of Portland's surprising offense. Portland's penalty kill also became more consistent later in the season, finishing at a respectable 80.2 percent, eighth-best in the 22-team league. "Our power play is very dangerous — either unit has the ability to score — and our penalty kill has come a long way," Johnston says. Part of an effective penalty kill — and long playoff runs — is strong goalie play. Kehler has provided that down the stretch. In his first season as a No. 1 goalie in the WHL, Kehler finished 32-17 with three shootout losses and two shutouts. His 3.10 goals-against average ranked 13th in the league. "He's played really well," Johnston says. "He's been through a lot of situations and circumstances. He's a good goaltender, and he's an older goaltender as a 19-year-old, so I think he was ready for the challenge this year." The young Hawks proved up to the challenge of the regular season. Now their growth will be tested. "We obviously had a really young team at the start of the year. I wasn't too sure how we were going to end up," Texeira says. "But I knew with Mike (Johnston) coming back that he was going to push every ounce out of every player, and it's really starting to show in those young guys." This will be the fourth WHL playoff experience for Texeira, one of six 19-year-olds who will be counted on as playoff leaders. His favorite memory is Portland's Game 6 rally in the 2014 WHL Finals, a night when Iverson's overtime winner forced a seventh game that the Hawks lost to Edmonton. Texeira's advice for his young teammates? Nothing heroic is required. "The best advice is just to play your game. Don't overthink it," Texeira says. "If they stick to that, they'll be absolutely fine."